Duryodhana was jealous of the prosperity of the Pandavas and wanted to rob them of their wealth. His uncle, Shakuni, made a plan. Yudhisthira loved gambling. They would invite Yudhisthira to Hastinapur for a game of dice. Shakuni was a master of the game and would throw the dice on behalf of Duryodhana and defeat Yudhisthira and win over his kingdom. Duryodhana liked this plan and asked his father Dhritarashtra to invite Yudhisthira. When Dhritarashtra hesitated, Duryodhana told him about the way Draupadi had insulted him and called him a blind man's son. Dhritarashtra gave his consent. 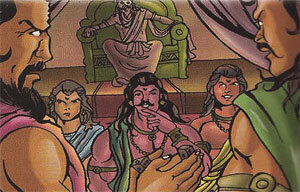 Yudhisthira gave his consent and came with his brothers to play the game. Shakuni used a charmed dice and defeated Yudhisthira again and again. Yudhisthira lost his palace, army, and the whole kingdom. Duryodhana was not satisfied at that, he encouraged Yudhisthira to stake his brothers. One by one, Yudhisthira lost all four of his brothers and then even himself. Duryodhana's joy knew no bounds. When Yudhisthira lost everything he had, Duryodhana said, "Why don't you stake something else, maybe this time you will win and get everything back?" Yudhisthira said, "I have nothing left to stake." At this Duryodhana said, "Why, you have Draupadi, stake her. "Yudhisthira was embarrassed by his defeat; he wanted to win everything back. He took his last chance and staked Draupadi. But he even lost her. Everybody was aghast at this turn of events. The Kauravas were jubilant.